How different is the Catholic Church in the United States that Pope Francis will visit in September from the Church his predecessors visited? Pope Paul VI was first to visit the United States in 1965. Pope John Paul II visited seven times between 1979 and 1999, however, two of these trips were short stopovers in Alaska in 1981 and 1984. Pope Benedict XVI visited in 2008. The figures below provide some detail about what the Catholic Church and the Catholic population were like during papal visits (where data are available). The Church reports annual statistics in The Official Catholic Directory. The most recent release is the 2015 OCD which includes totals for 2014. The tables below show data for the year they represent (i.e., not the publication year as reported on our frequently requested stats page) and include only the fifty states, the District of Columbia, and the U.S. Virgin Islands (i.e., excluding other U.S. territories totaled in the OCD). 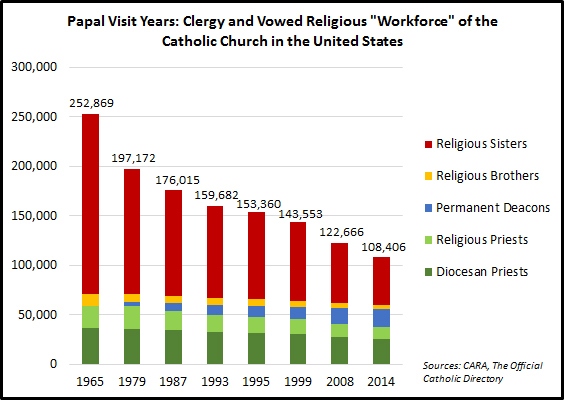 The clergy and vowed religious “workforce” of the Church in the United States is 57% smaller than it was in 1965 with about 144,000 fewer in ministry (note that some counted below are retired). Most of these losses have come among religious sisters and nuns. There are also about 21,000 fewer priests (diocesan and religious) now than in 1965 while the workforce has also experienced the addition of more than 18,000 permanent deacons. Numbers for Lay Ecclesial Ministers (LEMs) are not tracked year to year by the Church. In 1990, there were approximately 21,500 of these individuals who were “adequately formed and prepared lay persons, authorized by the hierarchy to serve publicly in leadership for a particular area of ministry, in close mutual collaboration with clergy.” In 2015, there were an estimated 39,500 LEMs in parish ministry in the United States. Married Catholics, as LEMs or as permanent deacons, are more present now in parish ministry than they were in decades past. 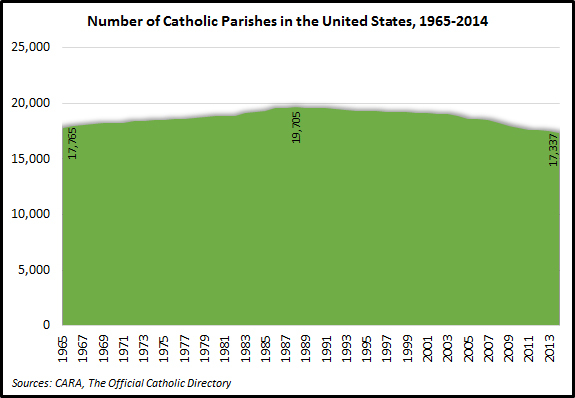 The number of parishes in the United States now is very similar to what it was in 1965. In 1988, the number of parishes peaked nationally at 19,705. Since then the Church has closed or consolidated parishes (as well as open new parishes) for a net decline of 2,368 parishes (-12%). Where are parishes closing? More often in the Midwest and Northeast than elsewhere. Bishops must balance the number of available priests with the needs of the Catholic population (see our previous post). They do this while also evaluating the changing demographics of their diocese. 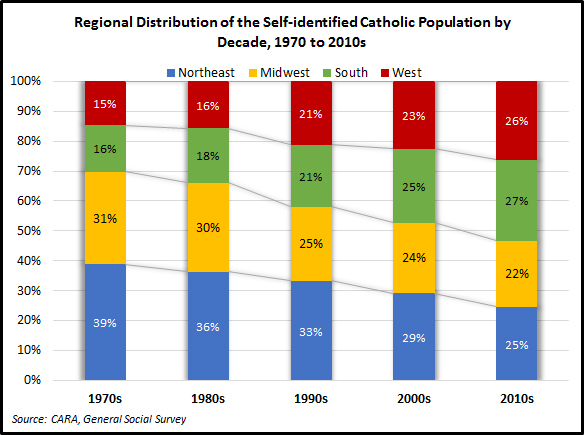 As shown in the figure below, the share of the Catholic population residing in the Northeast and Midwest has been in decline since the 1970s. The Catholic population is now more evenly divided among these four regions. In the coming decades, if current trends continue, it will become more and more a “southern” Church. As these population shifts have occurred, the Catholic Church’s U.S. parishes, many built to serve urban immigrants of the distant past, are increasingly misaligned with the 21st century Catholic population. The brick and mortar of the Church is slow to “move.” The Midwest has 37 percent of parishes and just 22 percent of the self-identified Catholic population. By comparison, the West has only 15 percent of parishes and 26 percent of the Catholic population. The Church is closing parishes where they are not viable but is behind a bit in its building of new parishes where they are needed most. If the next papal visit were to best meet the new demography of the Church in the United States it would happen in the Archdiocese of Galveston-Houston in Texas, which has added more parish-affiliated Catholics in the last decade than any other U.S. Arch/diocese. There are fewer parish-affiliated Catholics in the Archdiocese of Philadelphia now than in 2005 (about 33,300 fewer or a decline of -2.3%). The Arch/dioceses losing Catholic population in the largest numbers in the last decade include Brooklyn (-275,600), Detroit (-237,000), Pittsburgh (-167,900), and Chicago (-157,000). The fastest growing are Galveston-Houston (+667,600), Atlanta (+633,000), Fresno (+619,000), and Phoenix (+589,900). 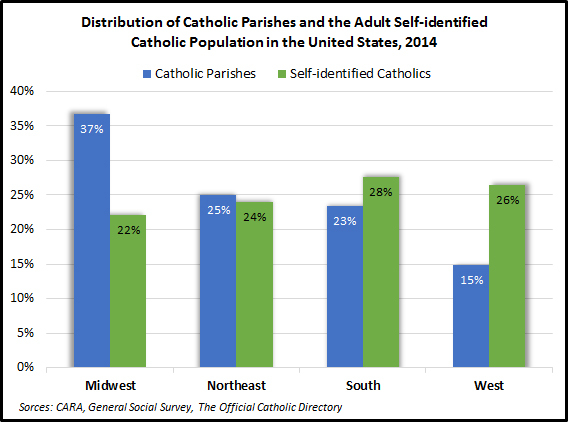 Overall, the self-identified Catholic population has grown steadily in the United States. Some of this is related to immigration. According to the General Social Survey (GSS), just 13% of Catholics were foreign-born in 1977. This share had climbed to 28% by 2014. Yet, immigration has also been a relatively constant long-term factor in Catholic population changes. For example, the Harris 1967 Survey of Catholics reported that 32% of Catholic adults at that time had all four of their grandparents born in the United States. In 2014, the GSS indicated this figure was 29% (by comparison this is 64% among non-Catholic adults in the same year). One big difference between then and now is the source of immigration. In 1984, 26% of adult Catholics said they were of Irish ancestry and 17% of Italian ancestry. These figures have fallen to 17% and 12% respectively in 2014, and now more Catholics say they are of Mexican ancestry than any other specific nationality (23%). The size of Catholic families has also declined. According to the GSS, 47% of Catholics of the World War II Generation (born 1901 to 1924) had five or more siblings. Among Baby Boomers (born 1943 to 1960) 31% had these many brothers and sisters. Only 19% of Catholic Millennials (born 1982 or later) have five or more siblings. We can see shifts in births in the Church’s baptism numbers. Birthrates were significantly higher when Pope Paul VI visited in 1965 and it is no surprise that there were more entries into the faith in that year than other papal visit years. Last year, about 870,000 new Catholics entered the Church in the United States. There were 160,376 fewer infant and child baptisms in 2014 than in 2008 when Pope Benedict XVI visited. Of course not everyone who joins the Catholic Church remains Catholic throughout their life. We don’t have comparable survey data for 1967 but the GSS gives a view of how baptized Catholics have lived out their faith (the GSS was not fielded in 1979, 1995, or 1999. However, in each case a survey was conducted the year before and after. We’ve averaged these results to come up with estimates for those visit years). 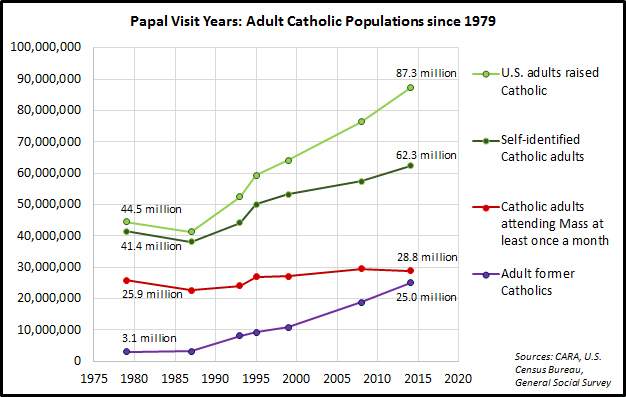 The figure below, shows how the adult population of those raised Catholic, who self-identify as Catholic, who attend Mass at least once a month, and who are former Catholics has changed during visit years since 1979. 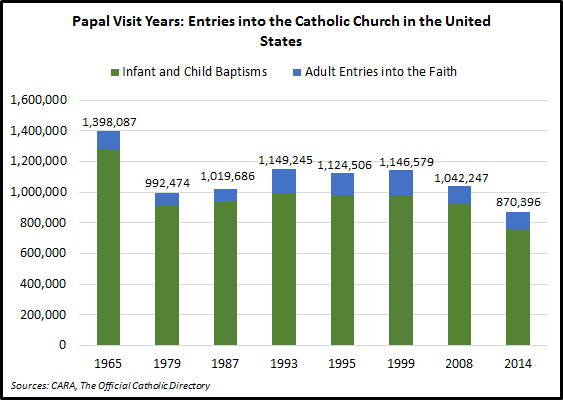 All of the trends except Mass attendance are increasing (…weekly attendance, not shown below, has declined from 41% of adult Catholics in 1977 to 24% in 2014. In absolute numbers, given population growth, this means there were an estimated 16.8 million weekly attenders in 1979 and 15.1 in 2014). Perhaps the most disconcerting trend is the increasing numbers of former Catholics who were raised in the faith but who have since left. This population is now nearly as numerous as adult Catholics who attend Mass at least once a month. 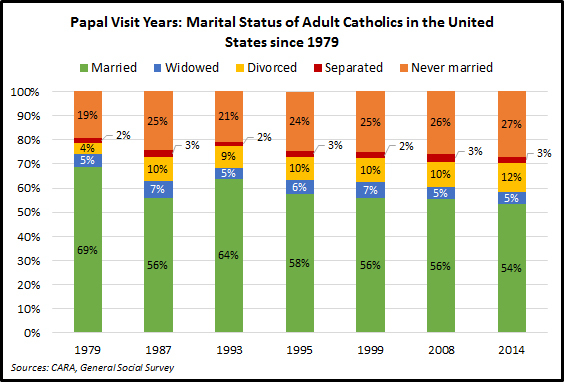 The precipitating reason for Pope Francis’ visit is to attend the World Meeting of Families, but no sacrament is in a steeper decline in the U.S. than marriage. In 1965, there were 355,182 marriages celebrated in the Catholic Church. By comparison, in 2014, only 148,134 were celebrated in the U.S. This represents a decline of 58%. Catholics are more often choosing civil ceremonies at country clubs, the beach, or other sites. The practice of marriage as a sacrament is becoming less common. Yet, something else has changed as well. In 1965, about seven in ten adult Catholics were married and only about one in five had never married. In 2014, just more than half are married and more than a quarter have never married. The percentage of those who are divorced has increased from 4% to 12%. Marriage, in general, is becoming more rare. Among U.S. Catholic parents with minor children, 79% are married. Thirteen percent are unmarried and living with a partner. Eight percent are either divorced, separated or widowed. CARA survey research indicates that only about 15% of divorced Catholics in the U.S. seek an annulment. As the number of marriages have declined so too has the number of annulments sought. About eight in ten of the U.S. Catholics who introduce an annulment case receive a decree of nullity (some do not and others do not complete the process). The Catholic Church in the United States that Pope Francis visits in September is quite different from the one his predecessors visited. There are new challenges and opportunities here. The number of new diocesan priestly ordinations has increased slightly since Pope Francis was elected (515 in 2014). There has also been an increase in adults entering the faith in the past couple of years (109,891 in 2014). Yet many young Catholics drift away from the faith to become unaffiliated and marriage in the Church is in steady decline. The Church is institutionally underdeveloped where the Catholic population is growing most rapidly and it is overbuilt in areas of decline. The Official Catholic Directory 2015 indicates that the shortfall between the number of active diocesan priests and the number of parishes in the United States remains entrenched despite 515 new ordinations in 2014 (...up from 494 in 2013). Nationally (including the Diocese of St. Thomas in the Virgin Islands and all Eastern Rite arch/eparchies in the U.S.), there are 16,462 active diocesan priests and 17,324 parishes. Thus, there are currently 862 more parishes than active diocesan priests. You would have to go back more than a decade, to 2004, to find a year in which the total number of these clergy was larger than the number of parishes. Of course not every parish needs an active diocesan priest (...It is also the case that not all priests are called to parish ministry). Religious priests serve as pastors and significant numbers of international priests have come to the United States to minister in parishes in recent decades. Priests from other U.S. dioceses (externs) and retired priests often help out as well. When no priest is available, bishops can utilize Canon 517.2 and entrust the pastoral care of a parish to a permanent deacon, religious sister or brother, or other lay person. These parish life coordinators (PLCs) minister, manage, and arrange for priests to come to the parish for Masses and sacraments. 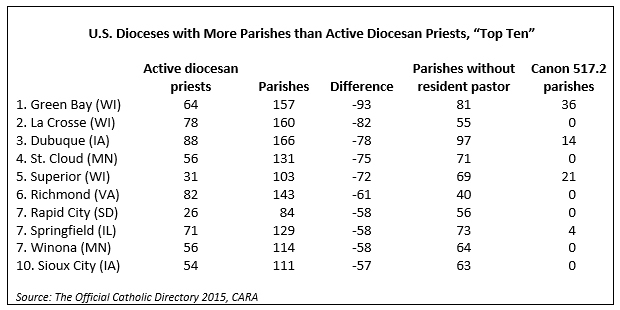 Which dioceses have the most parishes relative to their number of active diocesan priests? Nine of the top ten are in the Midwest. For example, the Diocese of Green Bay reports 64 active diocesan priests and 157 parishes. In all, 81 parishes here are without a resident pastor. Forty-five of the diocese’s parishes have a non-resident pastor and in 36 parishes pastoral care has been entrusted to a deacon or lay person. Nineteen of these parishes are entrusted to deacons, ten to religious sisters, and seven to other lay persons. Why would Midwestern dioceses be more likely to have fewer active diocesan priests than parishes? This region of the country used to be a population center for American Catholicism. However as many industrial parts of this region began to transform into the “rust belt” many moved to where the jobs were in the “sun belt.” In other words, the Catholics moved and the parishes remained. They still serve a sizable Catholic population but it is one that is aging. Many young adults raised in the region leave for the coasts or the South. Over time, smaller populations will lead to fewer ordinations. Geography is important in other ways as well. In rural America it can be difficult to use multi-parish ministry where a pastor or other ministers work in multiple parishes. In urban areas, a priest may find it possible to be a resident pastor in one parish and a non-resident pastor in another (…or more). When you are dealing with parishes separated by vast fields of corn or soybeans things become a bit more difficult. Closing a parish may also be undesirable if it still serves a community who may not easily travel to the next nearest parish. In some dioceses, bishops use PLCs to keep parishes open and in others they are less likely to do so. Nationally, there are 369 parishes entrusted to PLCs under Canon 517.2 (note there are statistical discrepancies in the OCD regarding parish administration. See the note at the bottom of this post. This total represents CARA’s corrections to these data). The number of parishes entrusted to deacons or a lay person peaked at 566 in 2004. This came fifteen years after the number of parishes overall peaked in the U.S. at 19,705 in 1989. Since that time the Church in the United States has reduced its total number of parishes by 2,381 nationally (a decline of 12%). Which dioceses have many more active diocesan priests than parishes? Half are in the Northeast and the rest are scattered about. The Archdiocese of Chicago has 579 active diocesan priests and 353 parishes. Yet even here, 26 parishes are without a resident pastor. In the United States, there are more priests retiring or passing away each year than there are new ordinations. The decline in active diocesan priests is expected to continue for some time as are net losses of parishes each year. These two trends are not unrelated. 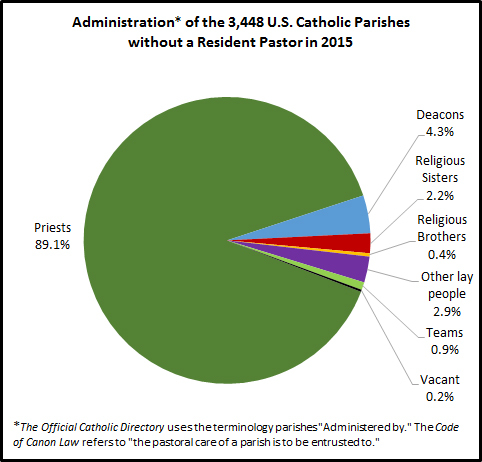 Currently there are 3,448 U.S. parishes without a resident pastor. Most, 89%, are administered by non-resident pastors. Four percent of parishes without a resident pastor are entrusted to a deacon, 3% to lay men or women, and 2% to a religious sister. Less than 1% each are entrusted to multiple individuals on a pastoral team or religious brothers. At any time a few parishes are vacant—a total of eight parishes when the data used here were collected. In previous research for the Emerging Models of Pastoral Leadership project, CARA identified that the most important factor in determining how a diocese balances the equation of active diocesan priests and parishes is the bishop’s preferences. When necessary, some entrust parishes to deacons, vowed religious, or other lay persons; others rely on non-resident priest pastors; and some find closing parishes to be the only option. The dioceses of Green Bay (WI), Superior (WI), and Albany (NY) have more than ten parishes where pastoral care is entrusted to deacons. The Diocese of Green Bay also has ten parishes entrusted to religious sisters. Albany, Indianapolis (IN), and Toledo (OH) each have seven parishes entrusted to women religious. Fairbanks (AK) has 15 parishes entrusted to lay men and women. Albany has nine parishes entrusted to lay people and Green Bay and Jackson (MS) have seven parishes each entrusted as such. In other dioceses like La Crosse (WI), Richmond (VA), and Winona (MN) there are numerous parishes without resident pastors but no Canon 517.2 parishes. Note: The parish administration data for a number of dioceses do not “balance” in The Official Catholic Directory. This analysis has used all available information to provide accurate counts. For example, The Archdiocese of Indianapolis has 125 parishes. Ninety-seven of these parishes has a resident pastor. Additionally, 17 have a non-resident pastor. This totals 114 parishes meaning 11 other parishes must be entrusted to others under Canon 517.2. However, the Archdiocese reports that 20 parishes are entrusted to deacons, vowed religious, or other lay persons. Among these, nine parishes are reportedly entrusted to religious brothers. Yet, the diocese reports only one professional minister who is a religious brother and none of the parish listings indicate a religious brother is entrusted with a parish. CARA has made corrections to the OCD data in this post to be as accurate as possible.